Xiaomi has launched Mi Soundbar along with two televisions Mi TV 4A PRO and Mi TV 4X 55 in India. Mi Sound bar’s best feature is that it can be set up very easily in just 30 seconds and Xiaomi kept the price at INR 4,999 on Mi official website. Mi Soundbar features 8 Sound drivers that should provide exceptional audio performance. It looks really minimal with a bar shape design that bears a fabric mesh exterior to make it look more classy. Xiaomi has also integrated enhanced bass to make the audio more thumping, improving the overall audio quality. With Mi Soundbar you can do many things like getting realistic sounds while games, Bluetooth music playback. Mi Soundbar also comes with Bluetooth 4.2 A2DP, which can be used to connect to any mobile device, TV, Laptop etc. In Addition to Bluetooth, it also has Line-In, AUX, Optical, and S/PDIF input options. It consists of 2 x 36mm dome tweeters which clear treble that compliments the surging bass, 4 Passive radiators that Amplify the bass for your enjoyment, and 2 x 65mm woofer drivers that covers a wide range of frequencies. The Xiaomi Mi Soundbar weighs around 1.9kg and has a Wall mounting option with screws in the box. 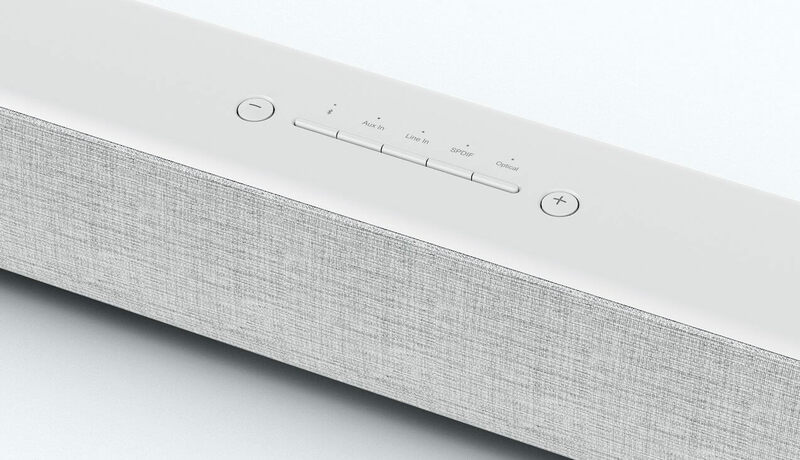 The soundbar comes in white color only and will be available from Mi.com and Mi Home stores starting 16th January 2019 at 12PM.